Mix miso with 1tbsp brown sugar in a small bowl for the marinade. Coat salmon fillets with miso marinade and set aside for 30 minutes. In a separate bowl, add the mirin and the rest of the miso and brown sugar, and whisk until smooth. Set aside for salad dressing. Prepare the vegetables for the salad. Boil edamame for 2 minutes, drain and add to large serving bowl. Blanch kang kong, white turnip and daikon, then sauté the mushrooms. Add kang kong, white turnip, daikon and mushrooms to the serving bowl. Pour dressing over the ingredients in the serving bowl and gently toss together. Set aside. Pre-heat oven to 180°C to 200°C. Place salmon fillets on parchment paper and bake for about 6–10 minutes or until salmon is tender and cooked to your desired doneness. 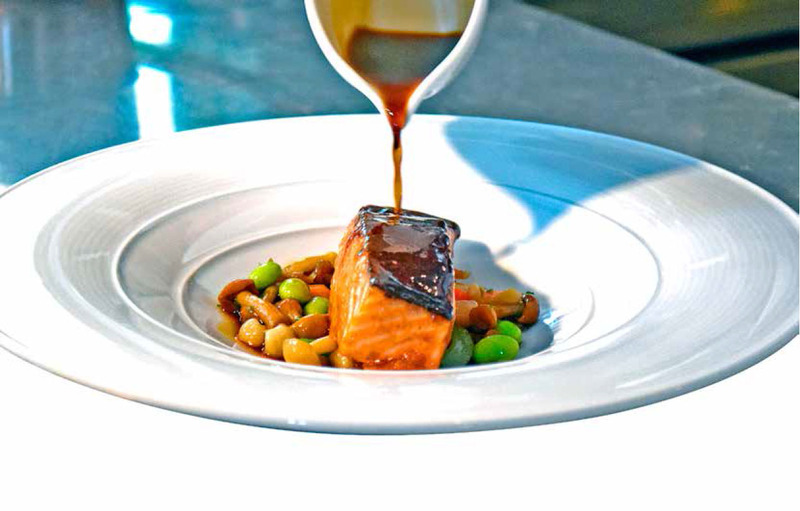 Serve salmon warm with edamame salad.